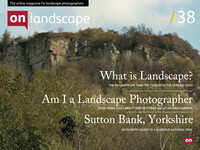 Whilst discussing plans for the magazine and other ideas, David Ward, Joe Cornish, Tim Parkin and Andrew Nadolski took the opportunity to record a round table discussion covering a question that has been asked more than once in the past (usually around mid October in the last few years) what exactly is landscape photography (or more usually put "That's not bloody landscape photography!"). The session was recorded for your offline delectation as long as you don't end up angrily disagreeing and causing pile up due to landscape photography inspired road rage. Please chip in with your own thoughts via the comments, email, twitter or facebook (preferably once you've stopped driving or get released on bail).